Western blot analysis of whole cell lysates probed with CHD4 antibody followed by detection with HRP conjugated Goat anti Mouse IgG (1/5,000, STAR207P) and visualized on the ChemiDoc MP with 36 second exposure. Arrow points to CHD4 (molecular weight 278 kDa). CHD4 antibody recognizes CHD4, also known as chromodomain-helicase-DNA-binding protein 4. Mouse anti Human CHD4 antibody recognizes CHD4, also known as chromodomain-helicase-DNA-binding protein 4. The product of this gene belongs to the SNF2/RAD54 helicase family. It represents the main component of the nucleosome remodeling and deacetylase complex and plays an important role in epigenetic transcriptional repression. Patients with dermatomyositis develop antibodies against this protein. Somatic mutations in this gene are associated with serous endometrial tumors. Alternative splicing results in multiple transcript variants encoding different isoforms (provided by RefSeq, Jul 2014). 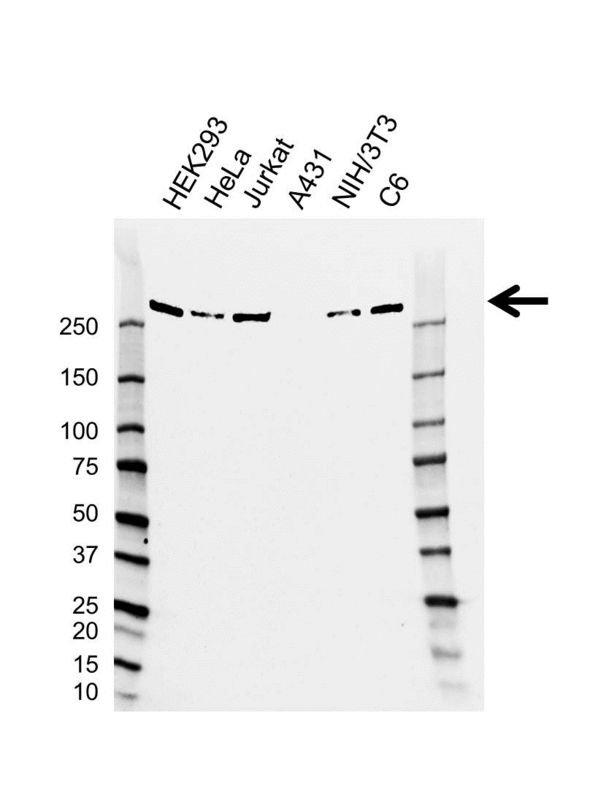 Mouse anti Human CHD4 antibody detects a band of 278 kDa. The antibody has been extensively validated for western blotting using whole cell lysates.